The cars were souped-up stagecoaches fitted to run on the rails. 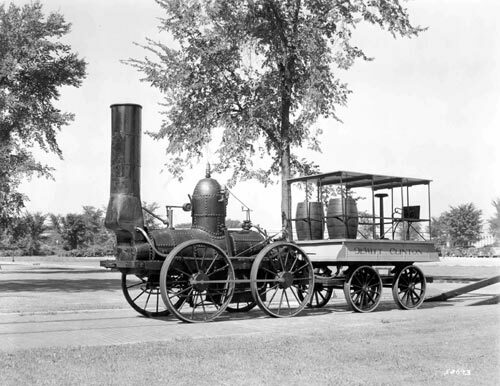 The locomotive was the DeWitt Clinton, one of the earliest ever built in America. And the passengers? They didn't know what they were in for. Silhouette artist William Brown was a passenger on the 1831 railroad journey. Afterwards, he made this piece depicting the locomotive and first two cars. In 1831, the first steam-powered passenger train in the country left from the spot today known as the Point on its maiden journey to Schenectady. Why did the train depart from here, so far from downtown Albany? Albany's hilly terrain was a challenge for these pioneering railroaders. But from the junction of Lydius Street and the Great Western Turnpike -- today's Madison and Western avenues -- a train could make a relatively flat run to the outskirts of Schenectady. So passengers boarded cars downtown, and with the aid of a rope and a stationary engine they were pulled uphill to the junction, where the DeWitt Clinton was waiting. At the other end of the journey, coaches would bring the passengers downhill into Schenectady. The company behind this grand experiment was the Mohawk and Hudson. Organized in 1826, the M & H was the first railroad chartered in New York state and one of the first in the country, earlier even than the Baltimore and Ohio. On September 24, 1831, a sizeable crowd gathered at the junction to watch the historic excursion. The M & H rail cars were full of city and state officials. A blast of a tin horn, and they were off. Steam-powered passenger railroading in America started with a jerk -- as the cars, connected by lengths of chain, lurched forward with enough force to throw the passengers from their seats and send their hats flying. Each of the outside passengers who had an umbrella raised it as a protection against the smoke and fire. They were found to be but a momentary protection, for I think in the first mile the last one went overboard, all having their covers burnt off from the frames, when a general melee took place among the deck-passengers, each whipping his neighbor to put out the fire. On reaching the first water-station they took down some fence rails and lashed them between the cars to take the slack out of the chain; that made the ride a little smoother. Farmers and their families lined the route — or did, at least, till the engine neared. Passengers described watching spooked horses bolt or upset their carts, sending spectators tumbling in every direction. This replica of the Dewitt Clinton locomotive was made for the 1893 Columbian Exposition in Chicago. It is now at The Henry Ford museum in Dearborn, Mich. Photo from the collections of The Henry Ford. But the train made it, reaching a top speed of 30 miles an hour. And as a mode of transportation, the horses’ days were numbered from that moment forward. It happened that William Brown, a silhouette artist visiting Albany, was there that day and made sketches of the train and its passengers. The piece that he later cut from black paper was widely reproduced, and it was hailed by other witnesses as an accurate representation of the train (though it shows fewer coaches than the train actually pulled). In 1844 the train was rerouted to leave downtown Albany through Tivoli Hollow. Railroading left the Point only 13 years after it had come.